Just as our body needs food to survive, so also our brain needs food to perform well. But that doesn’t mean we consume any which food to meet our brains requirement. There are certain foods which are specifically rich in nutrients that are essential to the proper functioning of the brain. Consuming them assumes importance because a healthy and active brain means a healthy you. Having the below mentioned list of foods will ensure that your brain remains active right into your sunset years. Blueberries are a powerhouse of antioxidants, substances that prevent premature ageing of the cells. It is seen that oxidative damage is one of the primary cause for degenerative diseases. Antioxidants by preventing oxidative damage protect the brain from the onset of degenerative diseases such as Alzheimer’s and dementia. In a study it was found that ageing rats that were fed on a diet of blueberries had improved motor skills and learning capacity that brought their mental faculties at par with younger rats. Avocadoes are rich in mono-saturated fats, omega 3 and omega 6 fatty acids. These fatty acids help in enhanced blood flow to the brain. Healthier blood flow means a healthier brain. Being rich in potassium and Vitamin K, avocadoes protect the brain against strokes. They are jam packed with antioxidants which protect our brains and our overall body against the harmful effects of free radicals. Legumes besides being rich in fiber contain complex carbohydrates. These carbohydrates along with the fiber aid in slow digestion thus enabling the body to absorb sugar slowly preventing the sudden spikes in sugar levels. Legumes and beans contain folate which is very essential for proper brain development. Chickpeas are especially rich in magnesium; a one cup serving of chickpeas contains 220 mg of magnesium. Magnesium is very essential for brain cell receptors, speeding up the transmission of message between brain cells. Furthermore magnesium relaxes the blood vessels allowing more blood to flow to the brain keeping them in good health. Chia seeds contain an abundance of omega 3 fatty acids and contain both forms of fiber. Due to the presence of fiber, they help to regulate the blood sugar levels in the body. Omega -3 fatty helps to improve memory and concentration powers and chia seeds being a rich source of omega 3 acids are the ideal food to have. Chia seeds are also known to increase communication between brain cells and also keep them free of plaque. Iron supplies oxygen to different cells of the body. The human brain too needs oxygen for its proper functioning and iron amply meets that requirement. Quinoa being a rich source of iron is the perfect brain food to have. Quinoa also contains Riboflavin (B2), a micronutrient which helps in better absorption of energy in brain cells. Drinking a cup of green tea daily can help protect the brain from dementia and other age-related illness. Green tea contains a compound called EGCG (epigallocatechin-3-gallate), which reduces the development of beta-amyloid proteins. Beta-amyloid proteins are implicated in the progression of Alzheimer’s disease thus green tea can provide one adequate protection from the onset of Alzheimer’s. Preliminary studies show that 1.8-cineole, a chemical contained in rosemary can lead to increased brain performance. In a study, the persons who were given rosemary oil performed better in both speed and accuracy tests. Rosmarinic acid, a compound contained in rosemary enhances blood circulation and increases the flow of blood to the brain. Tomatoes are rich in lycopene and beta-carotenoids, both powerful antioxidants which root out free radicals. 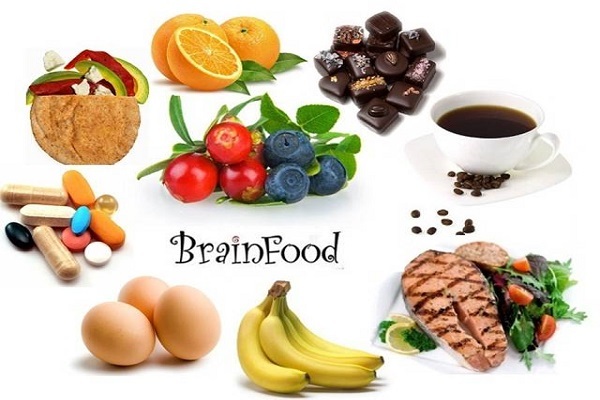 Our brain is made up of 60% fat and thus it needs added protection from free radicals. Lycopene is also known to influence the genes that regulate brain growth. Studies have shown that people with Alzheimer’s disease have low levels of lycopene in their blood. Vitamin E contains alpha tocopherol and gamma tocopherol both of which are essential for brain health. B Vitamins are responsible for creation of brain chemicals such as dopamine and epinephrine. Vitamin B12 helps in the genesis of myelin which acts as an insulating sheath around the axon of neurons. A deficiency of B12 can cause nerve damage and memory loss. Folic acid is another vitamin which is necessary to improve memory and concentration skills. Homocysteine is an amino acid that damages brain cells. Folic acid by helping to lower the levels of this amino acid in the body protects the brain. Pumpkin seeds are rich in omega – 3 fatty acids which is good for overall brain health and memory. Pumpkin seeds contain magnesium which helps to calm the brain. Pumpkin seeds also has anti-depressant properties hence when feeling depressed you can consume a handful of pumpkin seeds. It will lift your mood. Pumpkin seeds contain high amounts of zinc which is essential for the proper functioning of the brain. Among nuts, walnuts are the best for brain health because of the high amounts of DHA contained in it. DHA maintains brain health in newborns and leads to increased cognitive function in adults. By simply consuming a quarter of cup of walnuts, you can meet your required DHA requirements. It is seen that consuming higher levels of Vitamin E leads to improved cognitive function. Almonds and hazelnuts are naturally rich in Vitamin E, hence they are the ideal food to eat in order to prevent age-related cognitive decline. Niacin deficiency leads to increased chances of Alzheimer’s disease and cognitive decline. Peanuts are rich in niacin hence they can be consumed to prevent age-related diseases of the brain. A deficiency of choline in the diet leads to neural tube defects while the presence of adequate amount of choline in the body is known to keep the neurotransmitters healthy leading to sharp memory. A cup of broccoli contains about 182 mg of choline thus it is a good idea to include broccoli in one’s diet. Additionally, broccoli is rich in vitamin K which leads to better cognitive skills. Brewer’s yeast is a wonderful source of Vitamin B1 or thiamine and Vitamin B6 or pyridoxine. A deficiency of thymine can cause a type of dementia. Pyridoxine, on the other hand helps in improving memory and cognitive powers. Fortified cereals, bananas, black beans, eggs and sunflower seeds are all a good source of thiamine and pyridoxine. Fatty fish are a rich source of omega 3 fatty acids which has anti-inflammatory properties which in turn protects the brain from strokes. Sardines contain EPA and DHA both of which are necessary for proper brain development. Salmon comes packed with DHA. DHA is responsible for producing neurotransmitters, protecting the neurons from injury and reducing cerebral inflammation. It also maintains the brain health in newborns. Herrings are rich in omega -3 fatty acids, potassium and Vitamin B6. Potassium enables brain cells to send signals while Vitamin B6 produces chemicals essential for communication between nerves.